What other conditions can be mistaken for fungal nails? What are fungal nail symptoms and signs? What tests do health-care professionals use to diagnose fungal nails? Who should be treated for fungal nails? What specialists treat nail fungus? What is the treatment for fungal nails? Are there over-the-counter treatments for toenail fungus? Are oral medications for nail fungus toxic? 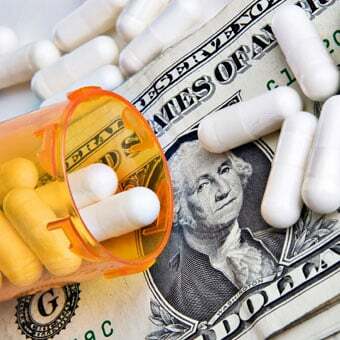 What about the cost of oral medications for fungal nails? Is it possible to prevent fungal nails? What is the prognosis of fungal nails? Is it possible to prevent the recurrence of nail fungus? Dr. Kyoung Min Han is a podiatrist (foot and ankle specialist) practicing in Southern California. Dr. Han completed her undergraduate education at the University of California, San Diego, and went on to the New York College of Podiatric Medicine to pursue her medical training. She returned to her native Southern California to complete a three-year foot and ankle surgical residency, followed by subspecialty training in a sports medicine fellowship. Many changes in fingernails or toenails may cause people to think they have a fungal infection of the nails, medically known as onychomycosis or tinea unguium. Fungal infection of the nails sometimes makes the condition sound contagious or related to poor hygiene. In fact, up to 10% of all adults in Western countries have fungal infection of the nails. This percentage increases to 20% of adults who are age 60 or older. Toenail fungus is much more common than fingernail fungus. In reality, abnormal-looking nails may be caused by a number of conditions including, but not limited to, fungal infection. There are many other reasons why your nails may look different. Onychomycosis is a fungal infection usually caused by a special type of fungus known as a dermatophyte. Since most of these infections are relatively superficial, it would seem that topical treatments ought to work well. This is not the case because the nail unit is relatively impenetrable. Lines and ridges: These are common and may be considered normal. They may worsen during pregnancy. A large groove down the center of the nail can be caused by nail biting. Some people may develop these changes following chemotherapy. Senile nails: As you age, the nails become brittle and develop ridges and separation of the nail layers at the end of the nail. To avoid this, try to clean solutions and don't soak the nails in water. Whitish or yellowish nails can occur due to onycholysis. This means separation of the nail from the nail bed. The color you see is air beneath the nail. The treatment is to trim the nail short, don't clean under it, polish if you want to hide the color, and wait two to three months. Persistent onycholysis can make the nails susceptible to fungal infection. Red or black nails due to a hematoma, or blood under the nail, usually occur from trauma (like whacking yourself on the thumb with a hammer). The discolored area will grow out with the nail and be trimmed off as you trim your nails. If you have a black spot under your nail that was not caused by trauma, you may want to see a dermatologist or a podiatrist if it involves a toenail to make sure it is not melanoma (a type of skin cancer associated with pigmented cells). A simple biopsy can rule out malignancy (cancer). Green nails can be caused by Pseudomonas bacteria, which grow under a nail that has partially separated from the nail bed. This infection may cause a foul odor of the nails. The treatment is to trim the nail short every four weeks, don't clean it, polish if you want to hide the color, and wait two to three months. It is also advised to avoid soaking the nail in any sort of water (even if inside gloves) and to thoroughly dry the nail after bathing. If the problem continues, there are prescription treatments that your doctor may try. 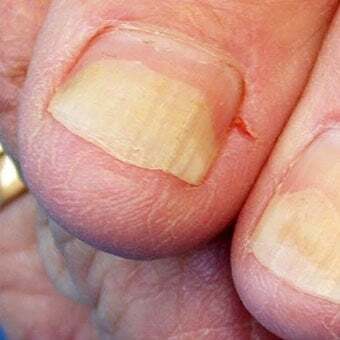 Pitted nails may be associated with psoriasis or other skin problems that affect the nail matrix, the area under the skin just behind the nail. This is the area from which the nail grows. Nails affected by psoriasis can also be tan in color. Swelling and redness of the skin around the nail is called paronychia. This is an infection of the skin at the bottom of the nail (cuticle). If the infection is acute (has a rapid onset), it is usually caused by bacteria. It may respond to warm soaks but will often need to be drained by a doctor. A chronic paronychia occurs when a cuticle becomes inflamed or irritated over time. Sometimes, yeast will take advantage of the damaged skin and infect the area as well. Therapy begins with keeping the skin dry and out of water. If the problem continues, a physician should be consulted. Antibiotics are not often used but may be necessary in severe infection. Chronic nail trauma, such as repeatedly starting and stopping, kicking, and other athletic endeavors, can cause damage to the nails that can look a lot like fungal nails. This sort of repetitive trauma can also occur with certain types of employment or wearing tight-fitting shoes. Some traumas may cause permanent changes that may mimic the appearance of fungal nails. In normal, healthy people, fungal infections of the nails are most commonly caused by fungus that is caught from moist, wet areas. Communal showers, such as those at a gym or swimming pools, are common sources. Going to nail salons that use inadequate sanitization of instruments (such as clippers, filers, and foot tubs) in addition to living with family members who have fungal nails are also risk factors. Athletes have been proven to be more susceptible to nail fungus. This is presumed to be due to the wearing of tight-fitting, sweaty shoes associated with repetitive trauma to the toenails. Having athlete's foot makes it more likely that the fungus will infect your toenails. Repetitive trauma also weakens the nail, which makes the nail more susceptible to fungal infection. Elderly people and people with certain underlying disease states are also at higher risk. Anything that impairs your immune system can make you prone to getting infected with the fungus. These include conditions such as AIDS, diabetes, cancer, psoriasis, or taking any immunosuppressive medications like steroids. While the fungus must be obtained from someplace, it is not highly contagious. Nail fungus is so common that finding more than one person in a household who has it is hardly more than a coincidence. It can be transmitted from person to person but only with constant intimate contact. Although fungal nails are usually cosmetic concerns, some patients do experience pain and discomfort. These symptoms may be exacerbated by footwear, activity, and improper trimming of the nails. 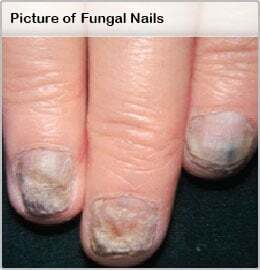 There are many species of fungi that can affect nails. By far the most common, however, is called Trichophyton rubrum (T. rubrum). This type of fungus has a tendency to infect the skin (known as a dermatophyte) and manifests in the following specific ways. Starts at the ends of the nails and raises the nail up: This is called "distal subungual onychomycosis." It is the most common type of fungal infection of the nails in both adults and children. It is more common in the toes than the fingers, and the great toe is usually the first one to be affected. Risk factors include older age, swimming, athlete's foot, psoriasis, diabetes, family members with the infection, or a suppressed immune system. It usually starts as a discolored area at a corner of the big toe and slowly spreads toward the cuticle. Eventually, the toenails will become thickened and flaky. Sometimes, you can also see signs of athlete's foot in between the toes or skin peeling on the sole of the foot. It is often accompanied by onycholysis. The most common cause is T. rubrum. Starts at the base of the nail and raises the nail up: This is called "proximal subungual onychomycosis." This is the least common type of fungal nail. It is similar to the distal type, but it starts at the cuticle (base of the nail) and slowly spreads toward the nail tip. This type almost always occurs in people with a damaged immune system. It is rare to see debris under the tip of the nail with this condition, unlike distal subungual onychomycosis. The most common cause is T. rubrum and non-dermatophyte molds. Yeast onychomycosis: This type is caused by a yeast called Candida and not by the Trichophyton fungus named above. It is more common in fingernails and is a common cause of fungal fingernails. Patients may have associated paronychia (infection of the cuticle). Candida can cause yellow, brown, white, or thickened nails. Some people who have this infection also have yeast in their mouth or have a chronic paronychia (see above) that is also infected with yeast. White superficial onychomycosis: In this nail condition, a doctor can often scrape off a white powdery material on the top of the nail plate. This condition is most common in tropical environments and is caused by a fungus known and Trichophyton mentagrophytes. Physical exam alone has been shown to be an unreliable method of diagnosing fungal nails. There are many conditions that can make nails look damaged, so even doctors have a difficult time. In fact, studies have found that only about 50% of cases of abnormal nail appearance were caused by fungus. Therefore, laboratory testing is almost always indicated. Some insurance companies may even ask for a laboratory test confirmation of the diagnosis in order for antifungal medicine to be covered. A nail sample is obtained either by clipping the toenail or by drilling a hole in the nail. That piece of nail is sent to a lab where it can by stained, cultured, or tested by PCR (to identify the genetic material of the organisms) to identify the presence of fungus. Staining and culturing can take up to six weeks to get a result, but PCR to identify the fungal genetic material, if available, can be done in about one day. However, this test is not widely used due to its high cost. If a negative biopsy result is accompanied by high clinical suspicion, such as nails that are ragged, discolored, thickened, and crumbly, it warrants a repeat test due to the prevalence of false-negative results in these tests. Most of the medications used to treat nail fungus have side effects, so you want to make sure of what you are treating. Medical treatment of onychomycosis is suggested in patients who are experiencing pain and discomfort due to the nail changes. Patients with higher risk factors for infections such as diabetes and a previous history of cellulitis (infection of the soft tissue) near the affected nails may also benefit from treatment. Poor cosmetic appearance is another reason for medical treatment. There are several doctors who can provide nail fungus treatment. Your primary care provider, a dermatologist, or a podiatrist can treat nail fungus. Any one of these doctors can provide proper diagnosis and prescribe medications specific to fungal infection. A podiatrist or dermatologist may shave the top layer of the nail off or even remove part of the nail. Ciclopirox (Penlac) topical solution 8% is a medical nail lacquer that has been approved to treat finger or toenail fungus that does not involve the white portion of the nail (lunula) in people with normal immune systems. In one study, ciclopirox got rid of the fungus 22% of the time. The medication is applied to affected nails once daily for up to one year. The lacquer must be wiped clean with alcohol once a week. Amorolfine topical solution 5%: There is some evidence that using an antifungal nail lacquer containing amorolfine can prevent reinfection after a cure, with a success rate of about 70%. However, this drug is currently unavailable in the United States. Oral antifungal therapy has a high cure rate, depending on the medication. It can take nine to 12 months to see if it has worked or not, because that is how long it takes for the nail to grow out. Even when therapy works, the fungus may come back. Currently, an oral antifungal therapy is considered the best treatment for toenail fungus because of higher cure rates and shorter treatment duration compared to topical therapy. Griseofulvin (Fulvicin, Grifulvin, Gris-Peg): This drug has been the mainstay of oral antifungal therapy for many years. Although this drug is safe, it is not very effective against toenail fungus. Disappointing long-term results have been reported. Newer agents have largely supplanted it. Terbinafine (Lamisil): This drug is taken daily for 12 weeks for toenails and six weeks for fingernails. The drug is safe, effective, and produces few side effects. However, it must be used with caution in patients with liver disease. This medication is also affordable. Itraconazole (Sporanox): This is often prescribed in "pulse doses" -- one week per month for two or three months. It can interact with some commonly used drugs such as the antibiotic erythromycin or certain asthma medications. It is considered the treatment of choice for onychomycosis caused by Candida yeast and non-dermatophytic molds. Fluconazole (Diflucan): This drug may be given once a week for several months. The dosing of this drug may need to be modified if the patient has impaired kidney function or is taking it simultaneously with certain other medications. It is not as effective as Lamisil or Sporanox and should be used cautiously in patients with liver disease. A doctor will determine whether a simple blood test is needed to check for liver disease. Laser therapy or photodynamic therapy uses application of light-activated agents onto the nail followed by shining light of a proper wavelength on the nail. Use of electrical current to help absorption of topical antifungal medications into the nail: This is also called iontophoresis. Use of a special nail lacquer that changes the micro-climate of the nail to make it inhospitable for the fungus to grow: If this works, it may be an inexpensive way to treat this problem in the future. One way to definitively get rid of toenail fungus is by surgery. Surgical treatment of onychomycosis involves nail removal. However, this often only provides temporary relief, and recurrence is common unless additional antifungal medication (oral or topical) is simultaneously used. However, surgical removal may be warranted when the affected nail is associated with other factors such as trauma and or infection. The Internet is filled with anecdotal information on how to cure toenail fungus using home remedies. Vinegar is a commonly recommended home remedy. Some people apply various oils such as tea tree oil, coconut oil, essential oils, and oil of cedar leaf (such as Vicks VapoRub) to their nails as well. The effectiveness of these home remedies is highly doubtful. Application of household bleach and hydrogen peroxide is also not recommended due to lack of evidence that these treatments work. These agents can also cause unwanted skin irritation. Thickened nails that have been affected by fungus can be difficult to trim. Using topical urea cream will soften the nail and make it easier to trim. These creams do not require a prescription. 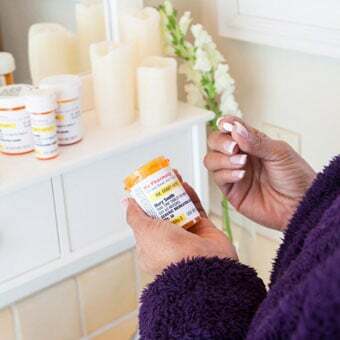 The definition of over-the-counter (OTC) products means that they are available by ordinary retail purchase, not requiring a prescription or a license. 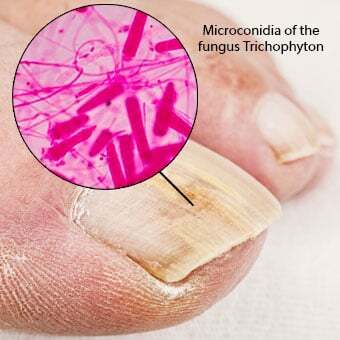 Although there are few OTC medications aimed to treat fungal nails, many of these medications have not been tested and therefore are not approved by the U.S. Food and Drug Administration (FDA) for the treatment of onychomycosis. Most OTC agents are aimed at treating fungal infection of the skin rather than the nail. Some medications list undecylenic acid and/or propylene glycol as main ingredients. These ingredients inhibit fungal growth; however, they may not adequately penetrate the nail to be effective in treating fungal nails. The newer drugs are unlikely to cause any liver problems in patients without known liver disease. Blood tests are not needed for once-weekly treatment with fluconazole (Diflucan); however, people taking longer courses often have their liver function tested before starting the medicine and then retested during the course of treatment. It is important to notify the doctor of all side effects while on the medication. You should tell your doctor of all current medications to prevent potential serious drug interactions. A further consideration is cost. Because newer oral antifungal agents are very expensive, some insurance companies balk at paying for what they consider a "cosmetic issue," unless nail fungus causes pain or other functional symptoms. Terbinafine and fluconazole are now available as generic drugs and are quite inexpensive. No one knows where a specific person catches the fungus, as it is everywhere. However, since the fungus does thrive in warm moist areas (like sweaty feet), there are certain areas one should avoid or use with caution. Shower floors, locker rooms, and swimming pools are suspected of being sources of the fungus, although there are no studies proving this fact. Nail polish and acrylic nails also make the nail less "breathable" and make the nail more susceptible to fungal infection. Fungi are everywhere -- in the air, the dust, and the soil. Hygienic measures such as spraying socks and footgear sound sensible, and perhaps these measures can even help a little bit. However, avoiding tight, nonbreathing shoes or steering clear of athletic facility floors may very well be the best prevention available. Daily washing of the feet and drying between the toes can help to prevent nail fungus. The fungi carried on the coats of pets, like cats and dogs, don't often cause nail fungus. Wearing white socks does not help. Curing fungal nails can be difficult and treatment can take up to 18 months. Relapse and reinfection are common. Trying to remove or modify your risk factors, if possible, is essential to preventing reinfection. People who have medical illnesses that predispose them to fungal nails can have an even more difficult time eradicating the fungus. Tinea pedis, also known as athlete's foot or foot fungus, can cause recurrence of fungal nails. Therefore, it is important to manage this condition. One can apply over-the-counter (OTC) antifungal medicines such as clotrimazole (Lotrimin) or terbinafine (Lamisil) cream as directed to affected skin. Keeping footwear and socks clean can be helpful. You can also use portable UV light sanitizers to disinfect shoes. you would like them treated for cosmetic reasons. Treatment failures and recurrences are common. Keep your toenails short, and don't dig into the corners of your nails when cutting toenails. Keep feet clean, and dry them thoroughly. Wear dry socks and no tight shoes. Don't soak your hands in water or use harsh cleaners. Treat athlete's foot when it occurs. Baran, R., R.J. Hay, and J.I. Garduno. "Review of Antifungal Therapy, Part II: Treatment Rationale, Including Specific Patient Populations." J Dermatolog Treat 19.3 (2008): 168-175. Brillowska-Dabrowska, A., S.S. Nielsen, H.V. Nielsen, and M.C. Arendrup. "Optimized 5-Hour Multiplex PCR Test for the Detection of Tinea Unguium: Performance in a Routine PCR Laboratory." Med Mycol. 48.6 Sept. 2010: 828-831. Bristow, I.R., and M.C. Spruce. "Fungal Foot Infection, Cellulitis and Diabetes: A Review." Diabet Med 26 (2009): 548.
de Berker, D. "Clinical Practice. Fungal Nail Disease." N Engl J Med. 360.20 May 14, 2009: 2108-2116. Derby, R., P. Rohal, C. Jackson, et al. "Novel Treatment of Onychomycosis Using Over-the-Counter Mentholated Ointment: A Clinical Case Series." J Am Board Fam Med 24 (2011): 69. Gaburri, D., J.M. Chebli, A. Zanine, A.C. Gamonal, and P.D. Gaburri. "Onychomycosis in Inflammatory Bowel Diseases." J Eur Acad Dermatol Venereol. 22.7 JulY 2008: 807-812. Garcia-Doval, I., et al. "Clinical Diagnosis of Toenail Onychomycosis Is Possible in Some Patients: Cross-sectional Diagnostic Study and Development of a Diagnostic Rule." Br J Dermatol. 163.4 Oct. 2010: 743-751. Ginarte, M., Garcia-Doval, I., et al. "Observer Agreement in Toenail Disorders: Implications for Diagnosis and Clinical Research." Br J Dermatol. 160.6 June 2009: 1315-1317. Gupta, A.K., L.E. Lynch, N. Kogan, and E.A. Cooper. "The Use of an Intermittent Terbinafine Regimen for the Treatment of Dermatophyte Toenail Onychomycosis." J Eur Acad Dermatol Venereol. 23.3 Mar. 2009: 256-262. Kondori, N., A.L. Abrahamsson, N. Ataollahy, and C. Wennerås. "Comparison of a New Commercial Test, Dermatophyte-PCR Kit, With Conventional Methods for Rapid Detection and Identification of Trichophyton rubrum in Nail Specimens." Med Mycol. 48.7 Nov. 2010: 1005-1008. Litz, C.E., and R.Z. Cavagnolo. "Polymerase Chain Reaction in the Diagnosis of Onychomycosis: A Large, Single-Institute Study." Br J Dermatol. 163.3 Sept. 2010: 511-514. Nair, A.B., S.R. Vaka, S.M. Sammeta, H.D. Kim, P.M. Friden, B. Chakraborty, and S.N. Murthy. "Trans-ungual Iontophoretic Delivery of Terbinafine." J Pharm Sci. 98.5 May 2009: 1788-1796. Shemer, A., B. Davidovici, M.H. Grunwald, H. Trau, and B. Amichai. "Comparative Study of Nail Sampling Techniques in Onychomycosis." J Dermatol. 36.7 Jul7 2009: 410-414. Shemer, A., H. Trau, B. Davidovici, M.H. Grunwald, and B. Amichai. "Onychomycosis in Psoriatic Patients - Rationalization of Systemic Treatment." Mycoses. 53.4 July 2010: 340-343. Sigurgeirsson, B., J.H. Olafsson, J.T. Steinsson, N. Kerrouche, and F. Sidou. "Efficacy of Amorolfine Nail Lacquer for the Prophylaxis of Onychomycosis Over 3 Years." J Eur Acad Dermatol Venereol. 24.8 Aug. 2010: 910-915. Smijs, T.G., and S. Pavel. "The Susceptibility of Dermatophytes to Photodynamic Treatment With Special Focus on Trichophyton rubrum." Photochem Photobiol. 87.1 Jan.-Feb. 2011: 2-13. Sotiriou, E., T. Koussidou-Eremonti, G. Chaidemenos, Z. Apalla, and D. Ioannides. "Photodynamic Therapy for Distal and Lateral Subungual Toenail Onychomycosis Caused by Trichophyton rubrum: Preliminary Results of a Single-Centre Open Trial." Acta Derm Venereol. 90.2 Mar. 2010: 216-217. Takahata, Y., M. Hiruma, Y. Shiraki, Y. Tokuhisa, T. Sugita, and M. Muto. "Treatment of Dermatophyte Onychomycosis With Three Pulses of Terbinafine (500 mg Day for a Week)." Mycoses. 52.1 Jan. 2009: 72-76. Thomas, J., et al. "Toenail Onychomycosis: An Important Global Disease Burden." J Clin Pharm Ther. 35.5 Oct. 2010: 497-519. Walling, H.W. "Subclinical Onychomycosis Is Associated With Tinea Pedis." Br J Dermatol. 161.4 Oct. 2009: 746-749. Foot pain and heel pain can be serious health problems. Discover information about cold feet, itchy feet, burning feet and swollen feet, along with foot pain causes and treatments. What treatment did you use for your fungal nails? What did your nails look like when you had a nail fungus? What were your signs and symptoms? If you've had a toenail fungus, how do you try to prevent it from recurring? Why did you go to a doctor for your nail fungus? How was the condition diagnosed? Athlete's foot (tinea pedis) is a skin infection caused by the ringworm fungus. Symptoms include itching, burning, cracking, peeling, and bleeding feet. Treatment involves keeping the feet dry and clean, wearing shoes that can breathe, and using medicated powders to keep your feet dry. Diflucan (fluconazole) and Lamisil (terbinafine) are anti-fungal medications used to treat different types of fungal infections. Diflucan is used to treat vaginal, oral, and esophageal fungal infections caused by Candida; UTIs, peritonitis, pneumonia and disseminated infections caused by Candida; and cryptococcal meningitis. Lamisil oral is used to treat fungal nail infections. Lamisil cream, gel, spray, and solution are used to treat jock itch, ringworm, and athlete’s foot. Diflucan (fluconazole) and Monistat 7 (miconazole) are anti-fungal medications used to treat vaginal fungal infections. Diflucan is also used to treat oral and esophageal fungal infections caused by Candida; urinary tract infections, peritonitis, pneumonia and disseminated infections caused by Candida; cryptococcal meningitis; and to prevent Candida infections in patients treated with chemotherapy or radiation after bone marrow transplantation. Monistat 7 is used to treat other infections (athlete's foot, ringworm) and severe fungal infections. Drug interactions, and pregnancy and breastfeeding safety information should be reviewed prior to taking this medication. Nails that are infected with a fungus may become discolored (yellowish-brown or opaque), thick and brittle, and may separate from the rest of the nail. See a picture of Fungal Nail Infection and learn more about the health topic. Griseofulvin (Gris-Peg, Grifulvin V, Griseofulvin Ultramicrosize) is an antibiotic prescribed to treat fungal infections such as ringworm of the body, athlete's foot, barber's itch, and fungal or ringworm of the nails. Side effects, drug interactions, dosing, storage, and pregnancy and breastfeeding information should be reviewed prior to taking this medication. Ingrown toenails are caused by the growth of the toenail into the surrounding nail fold. Symptoms and signs include toe pain, swelling, redness, and yellow drainage. Treatment at home involves soaking the affected foot in diluted white vinegar or Epsom salts, elevating the foot, and trimming the nails straight across. Surgery is also an option for severe cases. Prevent ingrown toenails by wearing shoes with a wider toe box and avoiding repeated injury to the toenails. Avoid curving or cutting the nails short at the edges. Itraconazole (Sporanox) is a medication used to treat fungal infections such as fungal nails, aspergillosis, blastomycosis, histoplasmosis, and candidiasis, as well as HIV and non-HIV infected individuals. Side effects, warnings and precautions, drug interactions, and pregnancy safety information should be reviewed prior to taking this medication. Nails may be a sign of disease in the body. Nails of abnormal color (pale, white, yellow, or bluish) may relate to an internal health problem. Ridges and lines on the nails can also be a sign of health problems. Terbinafine (Lamisil, Lamisil AT) is an antifungal medication prescribed for the treatment of fungal nails, jock itch, and athlete's foot. Side effects, drug interactions, warnings and precautions, and pregnancy safety information should be reviewed prior to using this medication.